by sharing relevant Google tools for veterans and families all over the world--you can learn more on the Google for Veterans and Families site. I specifically wanted to highlight a couple of these tools that enable people to map and tell their stories using Google Earth and Google Maps. For Veterans Day we’re featuring several stories created by veterans that show how Google Earth can be used to create a 3D virtual tour of their service history, complete with photos and videos. Fly back to the 1940's to hear about six siblings who served in WWII and an Army nurse who worked in post-war Japan. 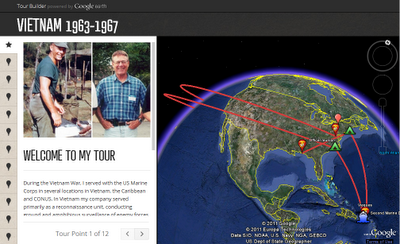 Then see where a Marine Lieutenant spent four years during the Vietnam War. Watching these tours requires the Google Earth plug-in, which you can download here. We hope to make this story-telling tool available to everyone soon. Google Maps makes it easy (and fun!) to create a simple Custom Map and also share with others. With our mapping tools, veterans can map their service and then share the personalized map with their families and friends. Stories, photos and videos can be geo-located so the complete story is recorded and marked on a map. We hope our mapping tools can be useful to the veteran community for sharing and recording life stories. For more other relevant Google products, we invite you to explore the Google for Veterans and Families site, www.googleforveterans.com. Today is Veterans Day in the U.S., and we’re honoring this community by sharing relevant Google tools for veterans and families all over the world--you can learn more on the Google for Veterans and Families site. I specifically wanted to highlight a couple of these tools that enable people to map and tell their stories using Google Earth and Google Maps.